On seemingly every list of the best places to live in the U.S., the bucolic town of Boulder, Colorado, consistently ranks in the top five. 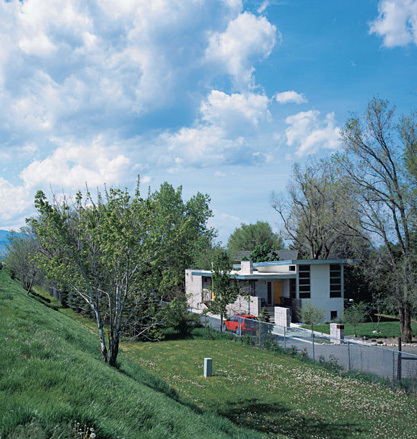 Fortunate locals enjoy inordinate amounts of sunshine, surrounding mountains offer skiing and climbing, and the city’s location in a greenbelt ensures a thriving landscape year-round. It’s no surprise, then, that residents take pains to preserve their environment, seeing as they spend so many hours frolicking in it. 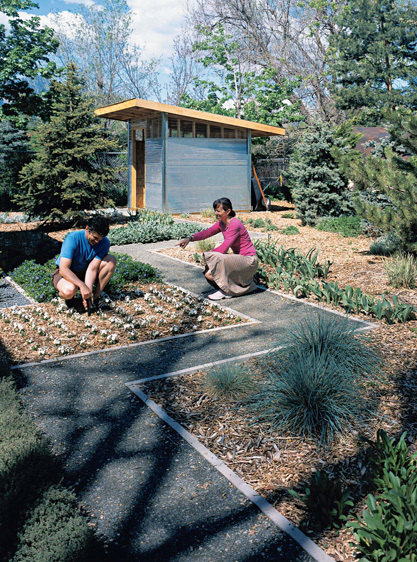 According to architect Joseph Vigil of local firm VaST, “Boulder was the first city in the nation to install the Green Points Program about 15 years ago, meaning that there are certain sustainability requirements for every new and residential remodel job in the city.” Points are given for each sustainable-design element homeowners choose—from recycled flooring to solar panels to tankless water heaters—and a building permit is issued only when a certain number of points have been met. Such rigorous measures enable the city to maintain its reputation for clean air and healthy living, creating an extremely desirable place to settle down but also making it difficult to find housing at a reasonable price. So when Vigil and his wife, artist and designer Brandy LeMae, decided to build their home “as sustainably as we could afford,” Vigil says, the first hurdle was to find land in their price range. “Most lots were around $450,000, for just the lot. And we knew there was no way we could pull that off,” LeMae explains. Eventually, LeMae stumbled across a site that was a relative bargain at $157,000. The only problem was that, like many good deals, it came with baggage. “One downside was the traffic and noise from the neighboring parkway; the other was that it’s a very awkwardly shaped lot,” states LeMae. But the price was right so they bought the space. As an added measure to preserve their modest budget, LeMae—who proudly admits to being “kind of a control freak”—decided to take on the job of general contractor herself. As many of their design decisions revolved around budgetary concerns, initially LeMae and Vigil were concerned that going green would prove too expensive. In the end, however, the 3,000-square-foot, three-bedroom house (plus a home office and LeMae’s design studio) ended up costing only $91 a square foot to build. Vigil asserts that some of their environmentally conscious decisions—such as the structural insulated panels— actually helped defray costs. The panels—solid slabs of Styrofoam sandwiched between two layers of engineered wood product used in place of stick framing—showed up onsite pre-cut and ready to install. Besides providing excellent insulation, they also allowed for very quick construction with minimal waste, helping to accelerate LeMae and Vigil’s building schedule and thus saving money in the process. Other building materials were equally carefully considered: The wood for the Sierra Pacific windows was sustainably forested, Forbo countertops are made of natural linoleum, radiant heating sits under the concrete floors, and all the landscaping was done with low-water and native plants. Where insulation was needed around window and door frames, instead of using the usual pink fiberglass they employed a cotton insulation, a denim industry by-product made up of trimmings that Vigil describes as having a texture “just like a Q-tip.” The quality of the house’s insulation, combined with windows placed high on the walls, modulates airflow in the house and passively cools the space when Boulder heats up. Instead of outfitting their home with expensive Case Study–era design icons, however, LeMae and Vigil bought most of their furniture from big-box stores such as Target and IKEA. Innovative nods to mid-century modernism were instead made spatially and structurally. In homage to Richard Neutra’s merging of interior and exterior spaces, a small pond where a koi and a few big goldfish swim in lazy circles sits embedded in concrete, surrounded by a small planting area—an ideal place for the couple’s curious four-year-old daughter to roam. Other touches, like an open floor plan and a sunken living room, borrow from Charles and Ray Eames. The result is a lean, green home in which the small family takes obvious pride. “We wanted to show that sustainable building does not limit you,” Vigil says. It’s a nice reminder that values-oriented design can indeed come cheap.